Paulist Fr. Matthew Berrios is a native of Grand Rapids, MI. He earned his bachelor's degree in 2011 in music and philosophy from Grand Valley State University. He first met the Paulist Fathers during a Sunday evening Mass at the Catholic Information Center in Grand Rapids. Fr. Matt entered our novitiate in the fall of 2011 and made first promises to our community in 2012. He made his final promises on Sept. 2, 2016, and was ordained a transitional deacon on Sept. 3, 2016. He was ordained a priest by Bishop Gerald Kicanas of Tucson, AZ, on Saturday, May 20, 2017, at our mother church, the Church of St. Paul the Apostle, in New York City. He celebrated his Mass of Thanksgiving ("First Mass") the following day, May 21, 2017, also at the Church of St. Paul the Apostle. 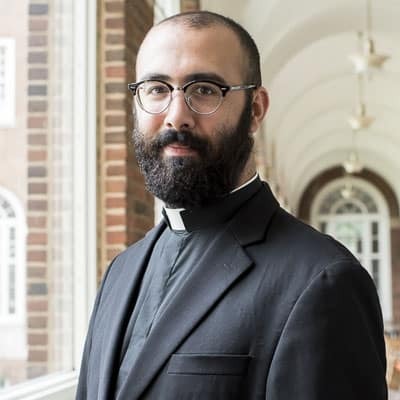 In May 2017, he also completed a Master of Divinity degree as well as a Bachelor of Sacred Theology (STB) from The Catholic University of America in Washington, D.C. In his first priestly assignment, he serves as associate pastor of the Church of St. Paul the Apostle in NYC. "Although I had many 'warning signs' of a possible vocation when I was a child, I did not discernibly feel a possible calling to the priesthood until later in high school. It began as a small feeling that arose out of the blue one day during my high school religion class. This feeling kept growing and growing all throughout the rest of high school and college. Further, the harder I tried to ignore it, the more forcibly it returned. I did not begin giving serious consideration to the idea of priesthood until I was a junior in college. When I finally opened up to the possibility, my first thoughts immediately went to the Paulists because of what I knew of them and their mission through the priests in the Grand Rapids house. From there it was just a matter of contacting the vocations director and beginning the process."